Click below to go to the next (or previous) section. In addition to filing resolutions about animal products, noted above, PETA this year has a proposal that raises concern about a type of laboratory animal test that has never been addressed in a shareholder proposal before. As economic inequality gapes ever wider in the United States, shareholder proponents have turned their attention to fair pay as well as the working conditions provided by companies. Women and people of color continue to earn less than their white male counterparts and the campaign to rectify these differences continues in 2019. (Workplace diversity is covered separately in this report, p. 45.) So far, proponents have filed 37 proposals. As in the last several years (see graph, page 42), most ask for more data on pay disparities. Seven from the New York City pension funds and the trade union consortium Change to Win take up the new issue of the inequitable impact of non-disclosure agreements, while HollyFrontier faces a question about accident prevention. Women: Arjuna Capital remains the most prolific of the proponents in this area; the New York City pension funds is a key player, too. Additional proposals on pay equity are from Proxy Impact, a shareholder advocacy advisor, and Pax World Funds submitted and withdrew one proposal. • At the other six—Alphabet, Amazon.com, Bank of America, Facebook, JPMorganChase and Mastercard—it seeks a“report on the company’s global median gender pay gap” as well as the information requested in the other resolution on risks. Numerous studies show women are paid less than their male counterparts. This is a key challenge for companies as they face reputational risk, consumer backlash, new legislation and governmental and employee lawsuits. Just the perception of a gender pay gap can make it hard to recruit or keep top talent. Votes last year for Arjuna on pay equity were 15.7 percent at Alphabet, 15.1 percent at Express Scripts and 10 percent at Facebook. The group withdrew most of its 2018 filings after reaching agreements with major banks about actions they planned to take to close their pay gaps. At 10 companies, the New York City pension funds want to know “whether there exists a gender pay gap among the company’s employees, and if so, the measures being taken (policies, programs, goals etc.) to eliminate any such pay disparities and to facilitate an environment that promotes opportunities for equal advancement for women.” It asks for the report by December 2019. Proxy Impact has asked Analog Devices, CIGNA and Pfizer to report “identifying whether a gender pay gap exists among its employees, and if so, outline the steps being taken to reduce the gap.” It also uses the OECD pay gap definition. Withdrawals—Arjuna has withdrawn following an agreement at Citigroup. Pax World Funds withdrew after Citizens Financial agreed to enhance its pay equity disclosures. It has asked the same things as Proxy Impact—about whether a pay gap exists and any corrective steps underway. Proxy Impact withdrew after a significant commitment from Pfizer. The company will hire outside experts to assess in the first half of 2019 whether it has a global gender pay gap and a U.S. race pay gap, and the sources for any gaps, and report publicly on the results by no later than early 2020. The company says, “we believe we pay our US colleagues fairly and equitably,” but it found a 14.5 percentage point pay gap in the U.K. and a 24.8 percentage point bonus gap. SEC action—Two company challenges have emerged so far. Bank of America and Wells Fargo both are contending the resolution impermissibly consists of multiple proposals and relates to ordinary business by seeking to “micromanage” the company. engage in any Inequitable Employment Practice. “Inequitable Employment Practices” are mandatory arbitration of employment-related claims, non-compete agreements with employees, agreements with other companies not to recruit one another’s employees, and involuntary non-disclosure agreements (“NDAs”) that employees are required to sign in connection with settlement of claims that any [company] employee engaged in unlawful discrimination or harassment. In a December 14 press release, Stringer said a hostile working environment at Alphabet/Google and CBS has prompted “public lawsuits and mass employee walk-outs,” with practices that have “wide-ranging impacts on the broader economy as well as workers’ rights.” The release said the targeted practices have been “pinpointed as drivers behind corporate cover-up of harassment and tools used to retaliate against whistleblowers.” It said the consequences are damaging to workers, investors and the public. Taking a similar approach, Clean Yield wants McDonald’s to report “on the potential impact on the company of emerging state and federal policies described in this proposal to prevent harassment and discrimination against any EEO-protected classes of employees by restricting nondisclosure and compulsory arbitration agreements.” The resolution takes note of a February 2018 letter from all 50 state attorneys general to Congress seeking an end to mandatory arbitration in sexual harassment cases, which said this would help end “the culture of silence that protects perpetrators at the cost of their victims.” It also points to related bills in 16 states and laws in seven states, while noting that several large companies have ended the practice. Companies face legal risks, damage to employee morale and productivity and other problems because of secret handling of problems, which are more acute for African Americans and Hispanics, according to the proposal. The proposals have come out of work from a group of 25 large institutional investors called the Human Capital Management Coalition (HCMC), sponsored by the UAW Retirees Medical Benefits Trust, which in 2017, petitioned the SEC to require more disclosure of information about a company’s workforce and human resources policies. Members of HCMC include the Nathan Cummings Foundation (NCF), Trillium Asset Management, the Office of the NY State Comptroller, and the AFL-CIO Office of Investment, among others. NCF has not filed any proposals yet but is engaging at least ten companies in dialogue on this issue. Thanks to Tarana Burke’s Me Too movement, TIME’S UP and others, it’s no longer possible to ignore the devastating impacts of discrimination, harassment and sexual assault in the workplace. In the business world, we’ve seen many alleged harassers removed from positions of power. But while Les Moonves and his ilk may be gone, it’s not always clear whether companies are taking steps to eliminate not just the alleged harassers, but the policies and practices that helped shield them from accountability in the first place. SEC action—McDonald’s has challenged the proposal at the SEC on the grounds that Clean Yield was not specifically authorized by a company stockholder to file the proposal, invoking SEC Staff Legal Bulletin 14I from November 2017. In its challenge, Yum Brands is contending the resolution concerns ordinary business because it deals with its management of the workforce and is not a significant social issue. The challenge also says the board executive committee examined the issue and found only 0.2 percent of its workforce has a non-compete agreement and that even if they exist, they relate narrowly to potentially forfeited incentive compensation. It says only a “small number” of employees submit to mandatory arbitration at Yum, but that arbitration is “widely accepted” as a means to keep legal costs lower. Further, it says Yum has not settled “a significant number” of sexual harassment claims—whether or not they might be subject to non-disclosure agreements, and that such agreements can prevent reputational damage if employees are subject to baseless claims. In any event, the company’s sexual misconduct policy training addresses the concerns of the proposal, Yum says. Finally, the company says the proposal seeks to micromanage it. Worker safety: The United Steelworkers have filed several proposals over the years about worker safety and this year the union is approaching HollyFrontier, asking it to “prepare a report to shareholders by the 2020 annual meeting...on process safety incidents, environmental violations, and worker fatigue risk management policies for the Company’s refineries.” The resolution will not go to a vote, however, because the SEC staff concurred with the company’s point that it was filed too late. The number of shareholder proponents about diversity at work has dropped by half to 16, down from 31. Just one this year is about LGBTQ rights; the rest address discrimination on the basis of race, ethnicity and gender. All seek more disclosure and action to provide equal employment opportunities. In a switch from earlier, only two of those now public are repeats, but three more also have been filed at undisclosed companies. Proponents have withdrawn two so far after agreements, but more accords are likely. A description of policies/programs focused on increasing diversity in the workplace. The proposal is new at Analog. At F5, Trillium withdrew in 2017 after the company agreed to include diversity information in its forthcoming sustainability report, but the company did not so it refiled—then withdrew this year once the company fulfilled its commitment. 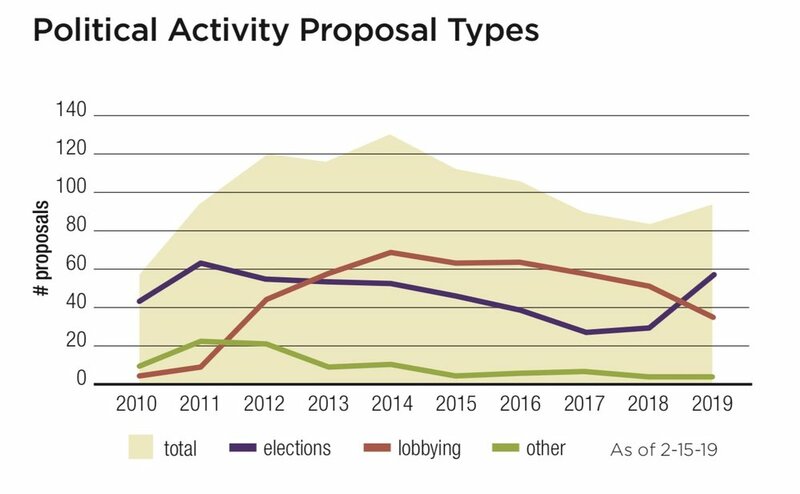 At Travelers, the proposal received 36.3 percent in 2018 and 36.4 percent support in 2017. A description of policies/programs oriented toward increasing diversity in the workplace. The 2019 proposal notes the company paid a $100,000 disability rights settlement in 2018 and settled a fair credit reporting class action suit in 2016 for $3 million. As a growing number of companies acknowledge the strengths of a truly diverse workforce, an area too often overlooked is executive team diversity. The business case for workforce diversity is compelling and some companies have gone to great lengths to define a diversity and inclusion strategy. But progress is slow at the highest ranks of companies, arguably where the most important strategic and operational decisions are executed. Where workforce data is available, it often illustrates the slow progress in building racial and ethnic diversity into the C-suite. Too frequently the representation of non-white employees and women rapidly diminishes with rank. New SASB request: At Fastenal and O’Reilly Automotive, As You Sow is testing out the applicability of material risk reporting issues defined by the Sustainability Accounting Standards Board. It asks for “a report to shareholders by 180 days after the 2019 Annual Meeting...assessing the diversity of our company’s workforce.” The proposal suggests the requested report should include data on gender for the company’s global operations and by job category in the U.S., adding race and ethnicity. It also seeks data on diversity-related legal costs and information on global diversity policies and programs. As You Sow withdrew at O’Reilly after a technical problem with the filing, but it remains pending at Fastenal. Executive diversity: In another new proposal, Trillium Asset Management is encouraging companies to provide more reporting on their efforts to diversify upper echelons of management. It asks Bank of New York Mellon, BorgWarner, Newell Brands and Marathon Petroleum to provide an “assessment of the current state of its executive leadership team diversity and its plan to make the company’s executive leadership team more diverse in terms of race, ethnicity, and gender.” At Bank of New York Mellon and BorgWarner, it praises the companies for progress on board diversity but says they should work on opening up executive jobs to more diverse executives, where women and people of color are underrepresented. It offers similar praise to Marathon Petroleum for its diversity programs in general but also concludes more work is needed at the executive level. At Carter’s, Trillium’s proposal is slightly different. It points out that the company’s disclosures are not sufficient to enable investors to assess the effectiveness of its efforts to expand executive diversity. It then asks for a report on its executive Strategy Board and diversification plans. Overdraft fees: Trillium Asset Management has a new resolution at Bank of America and JPMorgan Chase, asking each to report “evaluating overdraft policies and practices and the impacts they have on customers.” The resolution is concerned about the impact overdraft fees have on the poor. A similar proposal last went to a vote in 2010 and earned 23.6 percent support at BB&T. Deaths and costs from the burgeoning opioid epidemic continue to spiral upward. Investors, including state treasurers in states grappling with related budget impacts, are using a corporate governance lens to call for more transparency and accountability from companies connected to the crisis. ICCR members have long been concerned about the rising costs of prescription drugs. Last year, they hit upon a proposal about pricing risks and connections to executive pay incentives, an approach they are using again in 2019 (see p. 72 for information on nine proposals). Another proposal, however, was filed at Johnson & Johnson by the UAW Retirees Medical Benefits Trust. It focused on barriers to generic drug competition and the UAW Trust withdrew after the company agreed to further disclosure on the issue. After a dip in 2018, shareholder proponents have stepped up filing resolutions on human rights this year. They include a familiar set of proposals about reporting on human rights risks and how companies are implementing current policies. Only five directly address operations in contested territory—a dominant issue three years ago—but five ask for new types of disclosure about immigrants and the penal system, and three other new proposals seek transparency about how tech and communications firms try to prevent online child sexual exploitation. Another new proposal asks about Alphabet/Google’s China policies, Saudi Arabia’ human rights violations feature at Booz Allen Hamilton and Oxfam is looking for food-specific assessments of human rights impacts at Amazon.com. Another new resolution about products connected to hate speech is before Amazon.com, as well. Many of the recipient companies have not seen human rights proposals before, and many issues are new, tied to issues of intense public debate. In all, there are 44 proposals on human rights, with 33 now pending and nine withdrawn so far. At least six await the outcome of pending challenges at the SEC, and more challenges are likely outstanding given the backup at the SEC after the government shutdown. Risk assessments: Proponents are continuing a risk-based approach, seeking reports about how companies assess their supply chains and operations for red flags. At six—Amphenol, Corning, Hanesbrands, Macy’s, Texas Instruments and TJX—the request is for a report on each firm’s “process for identifying and analyzing potential and actual human rights risks of its operations and supply chain.” The resolution suggests that the company consider what principles should frame the assessment, how often it should occur, what metrics should be used to track and measure force labor risk and how the assessment results could be incorporated into company decisions. A low score for Hanesbrands from the 2018 Fashion Transparency Index, Know the Chain and the Corporate Human Rights Benchmark. A resolution from Oxfam America at Pilgrim’s Pride goes a step further and seeks a report on the company’s “human rights due diligence process to assess, identify, prevent and mitigate actual and potential adverse human rights impacts.” The proposal details problems with a wide range of worker’s rights in the meat industry and related environmental concerns, as well as what it says is public resistance to company expansions because of community impacts, alongside discrimination claims and environmental and labor fines. SEC action—Hanesbrands challenged the proposal at the SEC, arguing that the resolution is moot and concerns ordinary business. Texas Instruments also says it is moot given its current policies and disclosures. Withdrawal—NYSCRF has withdrawn an additional proposal also seeking a human rights risk assessment at Dunkin’ Brands after reaching an agreement. Amalgamated also withdrew at Hanesbrands following the challenge. Food and human rights: Oxfam America has another food-related resolution, at Amazon.com, which wants the impact assessment to be about “at least three food products Amazon sells that present a high risk of adverse human rights impacts,” and follows the same identify-assess-remedy approach as the other proposals. Investors gave 5.5 percent support to a proposal at Tyson Foods on February 7. Tyson is a family owned company with two classes of stock, which results in generally low votes. The American Baptist Church asked for a report on Tyson’s “human rights due diligence process to assess, identify, prevent and mitigate actual and potential human rights impacts.” The proponent felt the company’s current policies and level of disclosure do not provide adequate information on its human-rights related risks, some of which have short circuited its expansion plans because of environmental concerns. Tyson recently signed on to the United Nations Global Compact and must report on its progress and commitment to the code’s 10 voluntary principles. China: Azzad Asset Management has a new proposal at Alphabet, seeking a “Human Rights Impact Assessment...by no later than October 30, 2019, examining the actual and potential impacts of censored Google search in China.” The resolution says subsidiary Google is developing a search engine called “Dragonfly” that will “blacklist websites and search terms about human rights, democracy, religion, and peaceful protest.” Azzad says the project calls into question the company’s human rights commitments. develop and adopt a comprehensive human rights policy that includes an explicit commitment to support and uphold the principles and values contained in the United Nations’ Guiding Principles on Business and Human Rights, to be published no later than six months following the 2019 annual general meeting. The report shall be presented to relevant parties involved in contract approval and posted on the company website. has been repeatedly implicated in violations of basic human rights; among these are the 2018 assassination of Washington Post columnist Jamal Khashoggi and the military assault and blockade of Yemen. Yet, our company and its competitors have reportedly “played critical roles in [Saudi] Prince Mohammed [bin Salman]’s drive to consolidate power.” (“Consulting Firms Keep Lucrative Saudi Alliance, Shaping Crown Prince’s Vision,” The New York Times, November 4, 2018.). Fiduciary duty connection—Harrington Investments has resubmitted a proposal seen last year at PayPal for the first time asking it again to “modify its formal government document [to] articulate the fiduciary duties of Board and management to ensure due diligence on Human and Indigenous Peoples’ Rights.” It delineates a range of actions taken by the company that touch on human rights issues—from policies that protect LBGTQ employees, to terminating service for conspiracy theorist Alex Jones’s Infowars website as a violation of his terms of service, to “not denying financial services to Israeli settlers in the occupied West Bank and Gaza Strip.” It posits an explicit fiduciary duty tie is needed because current policies are non-binding and have “limited legal teeth or enforcement mechanisms and therefore minimal assurance of respect or protection for global Human Rights.” The proposal earned 5.9 percent last year and must reach 6 percent to qualify for resubmission. New policy—Mercy Investments has two more proposals. It asked Southwest Airlines to adopt or create “a comprehensive policy articulating our company’s respect for and commitment to human rights.” Mercy said the company has “no specific public commitment to respect Human Rights in line with” the UN Guiding Principles on Human Rights, and yet as “one of the world’s largest low-cost airline carriers [it] has significant leverage for identifying and addressing human rights risks in its operations and in its supply chain.” Mercy withdrew after the company agreed to study the Every Child Against Trafficking initiative and review and consolidate its human rights statements on its website. At Sturm, Ruger, Mercy’s resolution is the same, but adds that the policy (as with the other proposals noted above) should include “description of proposed due diligence processes to assess, identify, prevent and mitigate actual and potential human rights impacts.” It reasons, “Given the lethality of gun manufacturers’ products and the potential for their misuse, the risk of adverse human rights impacts is especially elevated for all gun manufacturers, including Sturm, Ruger.” In 2018, a proposal at the company about gun safety earned unprecedented 68.8 percent support. Gun-related deaths in the U.S. are at a 20-year high. In fact, data from the Centers for Disease Control and Prevention (CDC) show the number of deaths from gunfire to be nearly 40,000 in 2017 — the equivalent of 12 deaths per 100,000, and the highest rate since 1996. About 43 percent of U.S. households own firearms, and it is estimated there are more than 390 million guns in a country with a population of approximately 327 million. More guns than people – that’s an astonishing statistic.